← Why Do We Have Traditions? Numbers covers some 40 years of time between two generations of Israelites, the people numbered in two censuses taken out by Moses as instructed by the LORD. As in previous chapters, the Lord appeared to be strict, demanding and harsh to the people of Israel because “the fear of punishment and certain temporal promises have been necessary” (CCC 1964). They suffered plagues and punishments were taken out on them, i.e. the plague to the rebels (Num 16); the plague of fiery serpents (Num 21); the plague at Ba’al of Peor (Num 25) etc., “the Old Law prescribed charity” (CCC 1964) for God has infinite love and mercy towards man and God does nothing without the salvation of man in mind (CCC 313). For example, God answered to the pleas of the people when He struck them with the plague of fiery serpents. The Lord told Moses to set up a bronze serpent so whoever looked at it would live (Num 21:8-9). As stated in John Chapter 3, “and as Moses lifted up the serpent in the wilderness, so must the Son of man be lifted up” (John 3:14). The bronze serpent resembles a type of Christ so whoever believes in it/him may not die. 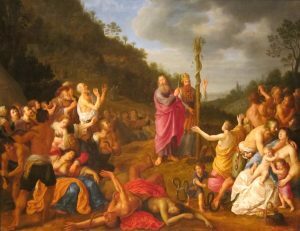 The sacrifice of Christ on the cross is the “one mediator between God and men” (CCC 618) and “the source of eternal salvation” (CCC 617). The merciful LORD wanted eternal salvation for all His people and it is only through the cross that man can reach Heaven. “Apart from the cross there is no other ladder by which we may get to heaven (CCC 618). Therefore, by “looking at the bronze serpent and live” (Num 21:9) resembles the Church’s venerations of Jesus’ cross, as ”Hail, O Cross, our only hope” (CCC 617).